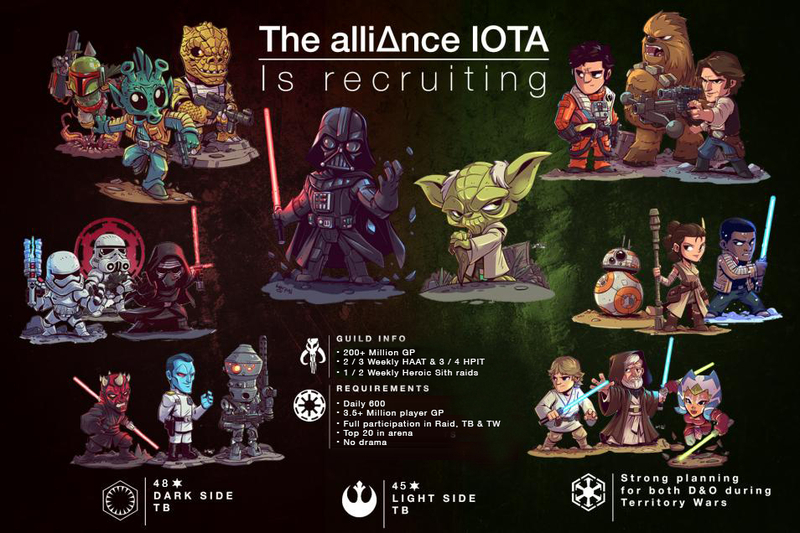 215mil+ Guild Is Looking For Members! Ranked Top 60 for GP. Ranked Top 50 for average Arena Rank. 45 stars on LS TB, 48 stars on DS TB. All heroic raids on farm. Stable guild with longstanding leadership & members. Founding Member of the Alliance Community. Be top 20 in arena. Have a TW oriented roster. Have GP within a reasonable range of our average. Be communicative and bring a positive attitude! Guild raids at 12.30pm and 2pm PST (7.30pm and 9pm UTC). Always time to post zeros. Always positive & fun loving while striving for success. We are an enthusiastic & collaborative group. Our guildies are like family & we're always having a good laugh. Join us for a chat and see how good we could be together! Needing to replace one retiring member! Speak to us, we promise good things will happen. Come chat, we love new people. Still looking for a fabulous addition to our guild family! Come say hello! Still recruiting! Come join we are party animals! We're fun. If you like fun, come talk to us. Join our recruiting server and say hello! Always looking for new recruits. Let's make Some memories for all of us. Join the server or message one of the tagged names in discord! The party is happening but you're not here. Why? Come join the server. Continually looking for serious players. Come see why we have so much fun. Log onto the recruiting server and come talk to us.